As a Toronto wedding photographer I follow the trends in social media and I know important it is for brides to have proper images taken during their preparation. Pinterest, Facebook and Instagram are filled with artistic images of the brides getting ready. Truth be told, that part of the big day when the bride and groom are preparing for the wedding ceremony is one of my favourites of the big day. First, I have some control over the events and can create gorgeous photographs. On the other hand, through the wedding ceremony I could never direct the bride and groom. As usually, at this Liberty Grand wedding, I instructed the bride and groom to build the timeline in such way so that we arrived when the bride was ready. In my experience as a professional photographer, the images I took before the bride makeup and hair were completed were unusable. Admittedly, the bride and groom browse hundreds of Pinterest boards and see countless images of couples getting ready. What they don't know, is that many of those photographs are in fact staged. Wedding photography is a big lie. I know, that is a bold statement, but hear me out. It is the duty of the professional wedding photographer to make his clients look best in their photographs. That is why all the portraits that go into the wedding album are carefully retouched. That is why on the wedding day we, professional photographers carry a ton of lighting equipment. The reality we create in a fractional second lasts a lifetime through the miracle of photography. Sometimes I participate to meetings of the Wedding Photojournalist Association in the Greater Toronto Area and some members argue that photography is about capturing moments during the big day and not about making the couples look good. I strongly disagree with that idea. In fact a professional wedding photographers should be able to do both: capture the moment and make the couples look amazing. In fact, after seeing her wedding photographs one of my brides said "no I understand why everybody in your pictures looks like a model." Now don't get me wrong! I cannot spend hours in Photoshop altering wedding photos forever. However, my goal is to make the couples look at least 10% better than in real life. That is achieved through posing, lighting and post processing. 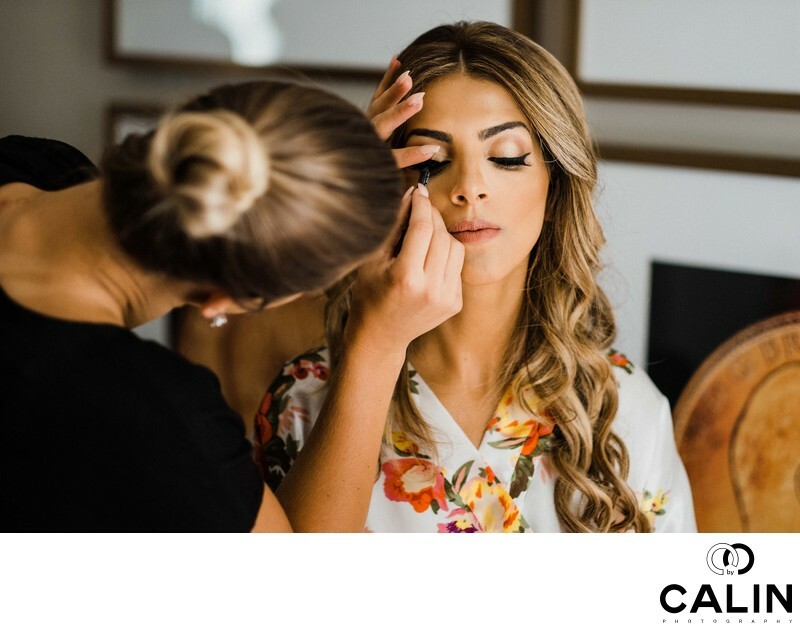 After all, my client spend a lot of money on professional makeup artists, hairstylists, decorators, florists, bakers, wedding planners to create their dream. Am I to deny them that pleasure? Unfortunately, as it happens in 90% of the weddings I document, things ran late. The bridal party was late, one of the bridesmaids' dresses malfunctioned, so the bride was running late for the main event, her outdoor wedding ceremony in the courtyard. Makes things worse one member of the wedding party did not like her hair and the hair stylist had to spend another half an hour to fix it. Fortunately, we were able to move fast through the first look and family portraits so that the guests did not realize what was going on. I have to admit that Liberty Grandis one of my favourites locations in downtown Toronto, if not in the greater Toronto area. Among the elements that makes this such desirable wedding venue I can list the following. First, the complex with its courtyard, fountain and beautiful banquet halls the Jordan with huge arched windows offers amazing backdrops for couple photographs and family portraits. Second, the venue is very close to distillery district and Castle Loma, to sought after photography locations in Toronto. Third and most important, the staff is extremely knowledgeable when it comes to weddings as the complex is host to around 400 marriages every year. They have been doing weddings for over 10 years so I guess they know a thing or two and you can rest assured they will make your special day phenomenal. Before the big day, I visited the venue with the bride and groom and it was apparent that the staff there loves their job. They were also very helpful in managing the events and from discussions with on the Toronto wedding photographers I realized the are true professionals.